The SAMSUNG UE32B6000 32-inch Widescreen LED TV brings the beauty of Crystal TV design to the home. Amazing LED Lighting contributes to the Mega Dynamic Contrast Ratio, and 100Hz Motion Plus renders judderless picture no matter how fast the action is on screen. Most significantly the UE32B6000 is an LED Television not LCD, or Plasma. But what is the real difference between an LCD and LED Television? Well LED stands for Light Emitting Diode and LED Televisions incorporate an LED backlight that converts electrical energy directly into light, therefore producing a richer and deeper colour and contrast respectively. LCD uses a simple constant backlight to illuminate the image on the screen, that is often too bright and can lead to blacks looking grey. Samsung LED TVs are 70% slimmer than most LCD Televisions. 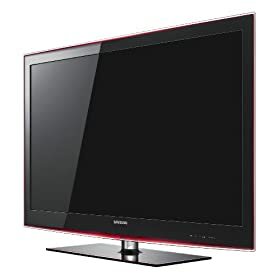 Samsung UE32B6000 runs at 100Hz, which is twice as fast as regular televisions, so since faster is always better, even the fastest sports or action movies, can be viewed in exquisite detail. The sheer amount of features in this TV and the connectivity, as well as its stunning looks with its Rose Black bezel and over all its performance which is achieved by all of the technology described above. Its truly incredible how much has been packed into something so slim and lightweight and we are really lost for words after that!